My Songkran setup: 1 Canon 5D Mark II body (with 28-70mm f2.8 zoom), a Kata rain cover, a plastic water proof pouch for cash and iPhone, ThinkTank Skin pouches, my 16-35mm and 70-200mm zoom lenses are in the pouches, which are covered by the included water proof covers that come with ThinkTank products. Songkran is probably the most famous holiday in Thailand. 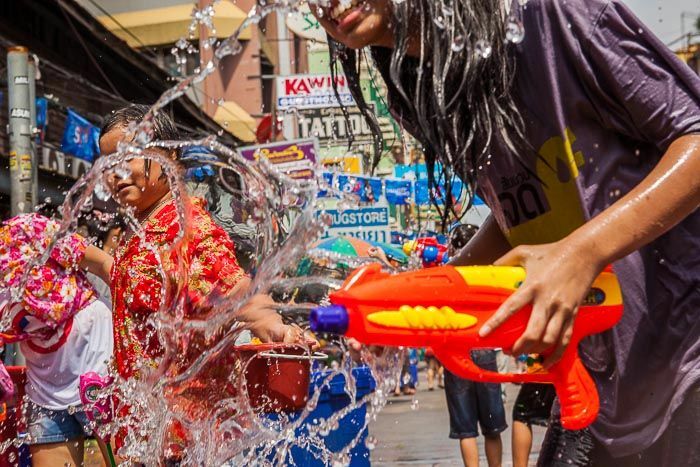 It's the traditional Thai New Year and celebrated with raucous water fights all over the country. You can be walking down the sidewalk, minding your own business, and find yourself drenched when a pickup truck full of Thai teenagers throw water on you as they speed past looking for another target of opportunity. Some neighborhoods, like Khao San Road, are closed to regular traffic and become virtual free fire zones of aquatic hijinks. If you're going to photograph Songkran, you're going to get wet. On one hand, covering Songkran is the easiest thing in the world. Go to the water fights and start photographing. Mission accomplished. But when you're covering Songkran, you have to make sure you're covered or you're going to end up covering some expensive repair bills for cameras that are not waterproof. I've been covering Songkran for years now and I have never lost or damaged a piece of equipment. This is how I do it. In my normal day to day photography I don't use zooms. I much prefer using fast prime lenses, like the Canon 24mm f1.4 or 50mm f1.2. If I need to change the perspective, I walk closer to or further from what I'm photographing or change lenses. But when you're in the midst of a water fight involving dozens of combatants, changing lenses is a really bad idea and you don't have the mobility you're used to. When I photograph Songkran I break out my zoom lenses and older camera body. Just because I've never damaged a camera in Songkran doesn't mean I never will and I don't want to wreck my 5D Mark III covering something as silly as Songkran. I use my old Canon zooms, which I don't normally use, because I can change up my field of view without changing lenses. Normally I work out of a shoulder bag. What can I say, I'm old school. During Songkran though I leave the shoulder bag at home and work out of a ThinkTank set of "Skin" pouches. I carry my old Canon 16-35mm f2.8 zoom (version 1 of the lens, more than 12 years old) and my old Canon 70-200mm f2.8 zoom (I think this lens is about 15 years old). The lenses ride in the ThinkTank pouches. ThinkTank includes brilliantly designed waterproof covers for the pouches. When I get down to the waterfight zone, I cover the pouches with the waterproof covers. It's not very stylish, but it keeps everything bone dry. My workhorse lens, and the one that is on the camera for about 75% of what I do for Songkran, is my really old Canon 28-70mm f2.8 zoom, which has been out of production for more than 13 years. I use the zooms one week a year - Songkran. At almost all other times I use my Canon prime lenses. For working on the street during Songkran I carry the camera and lens I'm working with in a Kata 702 rain cover. 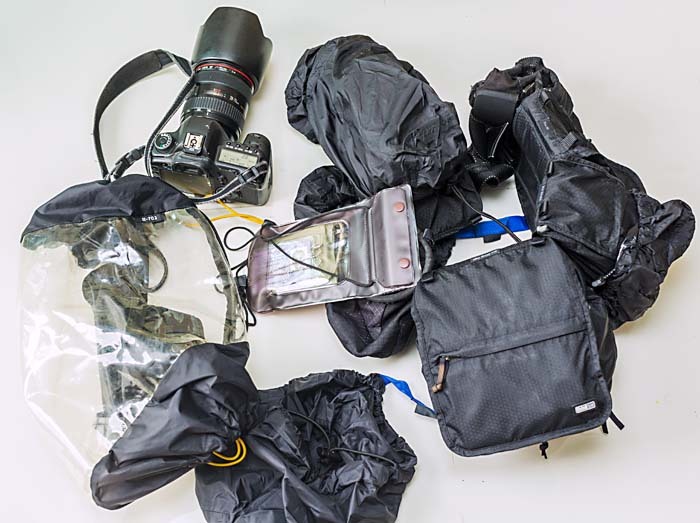 This is an exceedingly uncool way of carrying a camera but it keeps your gear dry and working. It's a giant clear plastic bag. The "front" has a drawstring and Velcro closure which keeps water out of the front. There is no lens covering, so it's important to use filters on your lenses to keep water off the lens itself. Your hands go into holes on the side, which also have drawstring closures. There's water and dust proof zipper and the bottom that seals the whole thing. There is no eyepiece cover per se. The rain cover is clear, so you look through the plastic case when you look through the viewfinder. It's a little awkward and strange looking but it works. It costs about $70(US) and is worth every penny. Finally, if you're going out to photograph Songkran, or any other water fight, don't forget your cash and iPhone. You will get wet. Really wet. Like last person off the Titanic wet. Anything in your pockets will also get wet, and your iPhone is not waterproof (neither is your Android if you were wondering). I bought a plastic waterproof case from a vendor at a BTS station for my iPhone and cash. It cost about 30Baht (one dollar) and keeps my smaller things snug as a bug in a rug. 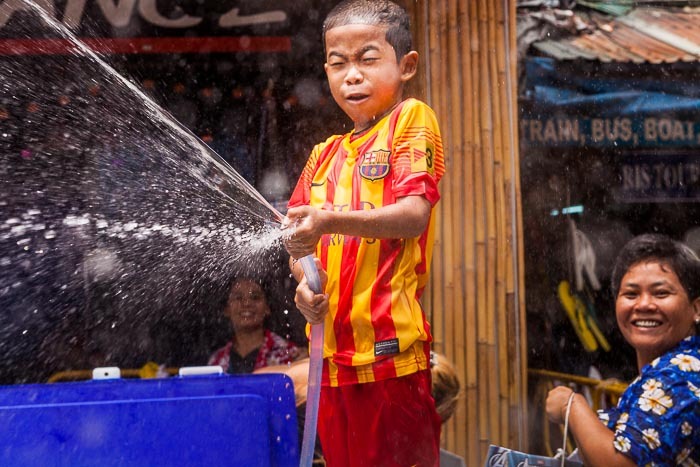 A child hoses down passerby during a Songkran water fight.